Apple CEO Tim Cook this week responded to an email sent by a customer who explained how iPad and iPhone helped their grandfather recover from cancer surgery —like an Apple commercial come to life. 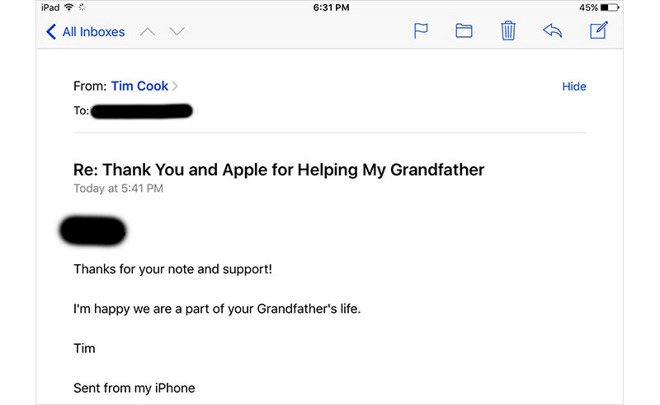 Posted to Reddit on Monday, Cook's reply to a letter written by user "bhanel" references a heartwarming story highlighting the real life impact iOS usability features can have on device owners. "[Cook's] reply was brief, but I'm impressed that he took the time to read my letter and respond at all," the Reddit post reads. "I think it's great that he takes time to read and respond to emails regular folks send him. I just thought I would share my story with you guys." In the letter to Cook, "bhanel" explained that their grandfather had undergone bladder surgery after being diagnosed with cancer late last year. The operation expectedly took its toll, leaving the former U.S. Navy man, pastor and business owner in pain, too weak to use his old flip phone. During the holidays last year, the unnamed man received a gift from his grandchild, a new iPad Air picked up from the local Apple Store (customer service was excellent, "bhanel" said). He didn't know how to use a computer, but after a being taught the basics the man was able to install apps on his own, and even started a dialogue with his doctor via FaceTime. Two weeks later and the grandfather had taught his wife how to use iPad and ditched his old flip phone for a new iPhone 6, a transition he told "bhanel" was made easy thanks to the consistent user experience Apple provides across iOS devices. It looks like Apple won over a new convert.